UFP Technologies to Exhibit at MD&M East 2014 in New York, N.Y.
May 8, 2014 - Georgetown, Massachusetts - UFP Technologies, a producer of custom-engineered components, products, and specialty packaging, will be exhibiting at the MD&M East 2014 (Medical Design & Manufacturing East) from June 10th-12th held at the Javits Convention Center in New York, N.Y. 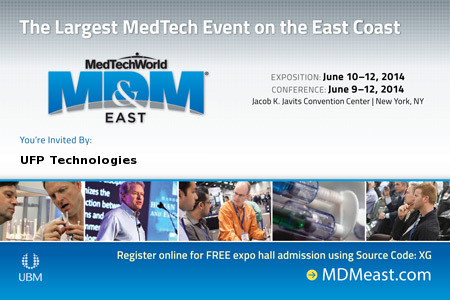 The MD&M East conference brings together suppliers in the medical device industry and provides them the opportunity to demonstrate their products and services to thousands of qualified medical OEMs. UFP Technologies will be located at booth #2215.